Last September we hosted our incredibly fun and educational inaugural user conference, Zoomtopia 2017. Well, we’re not wasting any time getting back into it…we’re excited to announce the second annual Zoom user conference: Zoomtopia 2018! Zoomtopia is a celebration of our customers and their successes, as well as an amazing opportunity to learn, grow, and develop relationships. 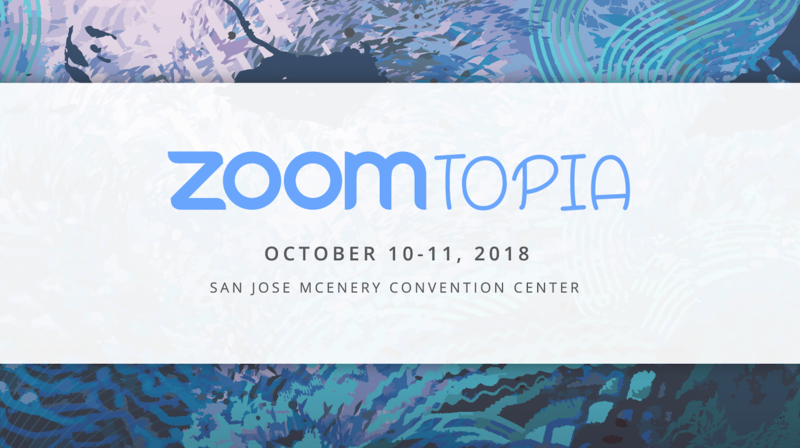 This year, Zoomtopia will be held at the San Jose McEnery Convention Center on October 10-11. Make sure to save the date on your calendar! First, by popular demand, we are more than doubling the number of speakers and breakout sessions to make our second Zoomtopia truly unforgettable and highly educational. Zoomtopia 2018 will feature insightful keynotes, breakouts, deep dive trainings, and workshops that will help you take full advantage of everything Zoom has to offer. This year we’re exploring topics including Meetings and Zoom Rooms administrator workshops, industry-based breakouts for such verticals as healthcare and education, function-specific sessions (for account administrators, webinar hosts, and so forth), embedding Zoom into your workflows, and API integrations. Second, lots of hands-on Zoom time! You’ll get all your questions answered and demo what’s new at the Zoom Expert Bar. Specialists for each Zoom product will be on hand to discuss everything from Webinars to Zoom Rooms. You can get all the details (that we’ve ironed out so far!) at zoomtopia.us. Be sure to get on the Zoomtopia 2018 guest list! Stay tuned for more surprises – our goal is to make you happy!